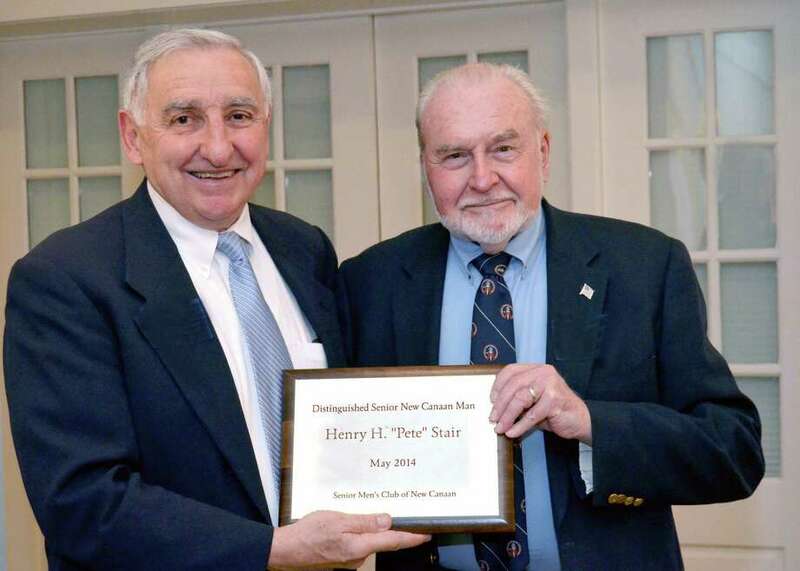 Ralph Hills, left, presents Henry H. "Pete" Stair with the 2014 Distinguished Senior New Canaan Man Award from the Senior Men's Club of New Canaan. Henry H. "Pete" Stair has been recognized as the 2014 Distinguished Senior New Canaan Man by the Senior Men's Club of New Canaan. The award, said committee chairman Ralph Hills, recognizes members who have provided exceptional and long-term service to the club, to the community. Stair was recognized at the club's annual meeting May 9 at the Country Club of New Canaan. Stair has been an active member of the club for 19 years and has served in many capacities including director, vice president of programming and speaker on various topics. He manages the club's website and leads the Internet and audio-visual technical support group. "Pete is an irreplaceable asset of the senior men's club," Bob Spence, club president, said. "SMC and New Canaan are very lucky to have someone like Pete Stair within our community." Stair is a licensed sightseeing guide in New York City and is the leader of the Sidewalks of New York for the club, hosting trips to venues such as the Tenement's Museum, 5 Pointz in Queens, Manhattan's Upper West Side, and a tour of the Subway Museum in Brooklyn. The trips have been extended to the Lapham Community Center and Staying Put in New Canaan membership. He was a co-developer of the original town website and led the group that maintained it for many years. He leads the Lapham Webmasters, has taught several classes on computer and Internet usage and is an active member of the Lapham PC Doctors helping members of the community resolve computer issues. He has been a technical support adviser to the town's election systems and helped in the implementation of the most recent ballot scanning systems. He is the main information technology adviser for the New Canaan Historical Society. Club member Bill Sessions said, "Pete Stair's IT skills are legendary; and so are his availability and selflessness in rescuing anyone needing help with computers, tablets or phones." Stair is a founding member of Staying Put in New Canaan Inc. He has enhanced its website and designed, installed and maintains its electronic communications equipment, and serves as a consultant to its members who need help with computer systems. Tom Ferguson, Staying Put board president, said, "Pete has given invaluable technology support to Staying Put since we began way back in 2007. Pete deserves enormous credit for building our office computer network and our website and for all the A/V support at our two major meetings each year. On top of all that Pete is a delight to all of us who have the pleasure of working with him." Stair is a member of the New Canaan Gridiron Club, which annually roasts a town resident while benefiting a local charity. He has managed the real-time prompting system for the cast of the show, is active on the New Canaan Library technical committee, provides website design guidance, and has helped resolve problems with the town's fiber optic systems and the library's outside vendors' websites. "I believe that volunteering is the perfect way to feel connected to New Canaan and the senior men's club has many talents to offer this community," he said.